UC Irvine baseball (29-24, 9-12) welcomed UC Santa Barbara (35-16-1, 12-9) to Anteater Ballpark over the weekend, splitting the first two games, before dropping the series finale. On Friday night, the Gauchos got on the board first, scoring the game’s first three runs in the third inning. The ‘Eaters would respond in the bottom of the inning, after junior outfielder Adam Alcantara hit an RBI single with the bases loaded to score a run, but even though the bases remained loaded after the at bat, two consecutive strikeouts prevented UCI from pulling any closer. In the fourth, UCSB would score two more runs in the top of the frame before the Anteaters would respond with two runs of their own in their half of the inning. With the bases loaded, sophomore Keston Hiura would hit a two RBI single to cut the ‘Eater deficit in half, but it would be the last time UCI would score, as they only put one runner on second the rest of the game. The Gauchos would score a run in the sixth before exploding for four runs in the seventh to gain a seven run lead and put the game out of reach. 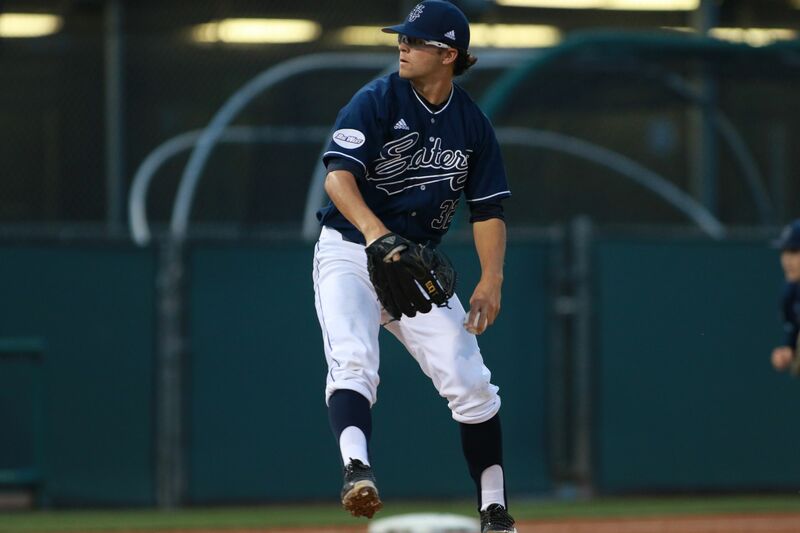 After falling to the Gauchos on Friday, the ‘Eaters pulled out a gritty 5-4 victory Saturday off an infield single from junior Adam Alcantara that brought junior Evan Cassolato home. It was a frustrating game all around as senior starting pitcher Elliot Surrey struggled on the mound, allowing eight earned runs in a six and a third innings, while also hitting four batters and committing an error. The ‘Eaters also struggled on the offensive side of the plate, as they left a total of eleven runners on base despite accruing eleven hits. Saturday night’s game would see UCSB open up the scoring in the third inning again, scoring two runs this time, before adding another run in the fourth for the first three runs of the game. UCI would respond in the bottom of the fourth with three runs of their own to tie the game. Sophomore infielder Cole Kreuter would cut the Gaucho lead to one after a two RBI triple and would come in and tie the game after a sacrifice fly. In the fifth inning, the ‘Eaters would take their first lead of the series after an RBI double from Alcantara would score a run, but an attempt to score a second run on the hit would be thrown out at the plate, ending the inning with UCI up, 4-3. UC Santa Barbara would tie the game in the seventh inning and the score would remain tied entering the ninth inning. The Gauchos would threaten in the top half when they put the go-ahead run on third with two outs, but a flyout would end their threat and bring the Anteaters up to the plate with a chance to win the game. With the bases loaded, Alcantara would prove to be the hero, hitting an infield single to bring in the game winning run and tie the series at one game apiece. Sunday night’s rubber match started off well for the ‘Eaters as they scored the first five runs of the game. In the first inning, a passed ball and a groundout scored the first two runs of the game for UCI before an RBI single from Kreuter gave the Anteaters a three run lead. The second inning saw the ‘Eater lead grow to five runs after an RBI single from Hiura and an RBI double from senior infielder Mitchell Holland. UCSB would get a run back in the fourth, but would struggle the rest of the game against sophomore starting pitcher Cameron Bishop, who struck out a career high eleven batters. UCI would keep a four run lead until the eighth inning, when after a hit batter and a single, Bishop would leave the game. After the Gauchos put another runner on to load the bases, a grand slam would tie the game. Looking to respond, the ‘Eaters would put a runner on third in the bottom half of the frame, but UCI was unable to bring him in as the game entered the ninth inning. UCSB would load the bases again in the ninth and after a walk would give them the lead, a bases clearing double would give UC Santa Barbara a four run lead entering the bottom of the ninth, where UCI would go three up, three down to end the game. UCI will end their season with a three game series against Cal State Northridge starting on May 26 at Anteater Ballpark.